The latest OS might night be out yet, but despite the lack of Ice Cream Sandwich, folks are still buying Android handsets by the boatload. Google yesterday revealed that in the three years since Android first launched, 200 million phones have been sold and its activating half a million every day. Speaking at its Google Music event yesterday, Google revealed its impressive numbers, which amount to an increase of 150,000 activations per day compared to May. Speaking at Google I/O earlier this year, Hugo Barra, Product Management Director for Android, gave attendees a quick recap of the kind of growth Google’s mobile operating system has seen since it launched in October of 2008. 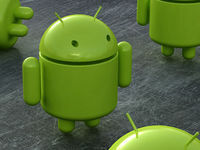 Barra reported that Android use had skyrocketed to 100 million worldwide activations and about 400,000 more each day. Google yesterday confirmed that this 100 million activations figure has doubled in the last six months and the company is now averaging 550,000 each day. Of course, it’s not fair to compare Android activations to iOS activations, because while there’s only one iOS phone, there’s countless Android devices. However, despite Android’s advantage of multiple devices, Apple has activated 250 million iPhones and so, is still ahead. Still, it’s not by much, and with the rate Android is going, it won’t take Google long to catch up.